WELCOME, N.C. (October 17, 2018) – Bubba Wallace continues to make national headlines in his rookie season in the Monster Energy NASCAR Cup Series driving the famed No. 43 for Richard Petty Motorsports. Wallace Jr. was recently named to the EBONY Power 100 list published by EBONY Magazine. Wallace Jr. was listed as an “MVP” and joined other athletes such as Antonio Brown, Stephen Curry, Venus Williams as well as former President and First Lady Barack and Michelle Obama on the prestigious list. The list is to recognize and celebrate the most inspiring and influential leaders of color who are impacting and shaping our world today. This year’s list includes people who have had made a significant impact in creating movements, changing culture and bettering society. Wallace Jr. burst onto the Monster Energy NASCAR Cup Series scene during this year’s Daytona 500, finishing second. He later scored a Top-10 finish at Texas Motor Speedway and then raced the iconic No. 43 STP Chevrolet Camaro ZL1 to the front at Bristol Motor Speedway. 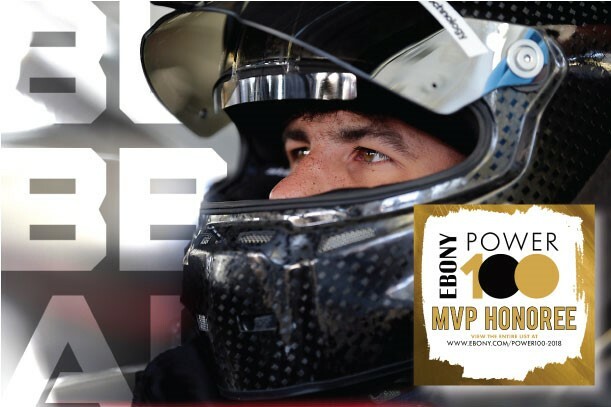 He has also earned numerous Sunoco Rookie of the Race awards throughout the season and has led laps at Bristol, Pocono Raceway and Talladega Superspeedway. Off the track, Wallace Jr. has proven to be one of the fastest-rising stars not only in NASCAR, but in all of sports. Social media leader, Facebook, began the year following Wallace Jr. leading up to his first Daytona 500 start. The “Behind the Wall: Bubba Wallace” Facebook Watch digital docuseries propelled Wallace Jr. into the mainstream media with over five million views. Wallace Jr. has also been named as one of the top 50 Most Influential People in Sports Culture by Bleacher Report and one of the World’s Most Marketable athletes named by SportsPro. Wallace Jr. will compete this Sunday in the Hollywood Casino 400 at the Kansas Speedway. A performance and marketing driven company, Richard Petty Motorsports (RPM), co-owned by NASCAR Hall of Famer Richard Petty and successful business entrepreneur Andrew Murstein, is one of the most recognized brands in all of motorsports. RPM is the winningest team in NASCAR Cup history with 273 wins and has business partnerships with national and global leaders. Today the race operation fields the famed No. 43 in the Monster Energy NASCAR Cup Series with driver Darrell “Bubba” Wallace Jr. The team is headquartered in Welcome, N.C. and is supported by primary partners Click n’ Close, STP, United States Air Force and World Wide Technology.